When my parents asked if I had interest in visiting a glacier while in Norway, I was in Africa. I had proper hiking boots with me and, thanks to the generosity of friends, warm clothes to layer. So when I wholeheartedly said yes, I thought I’d have these things with me. But life had other plans and as it happened, I gave away most of those warm clothes and the rest I dropped off along with the boots back in the States. So when the rainy day came for me to walk on a glacier, I had only a pair of lightweight walking shoes more suited to the warm climate of SE Asia than a cold wet surface of frozen water. Had I not kept a pair of wool socks with me, my feet would have been numb. As it was, they were just waterlogged for a very long time. 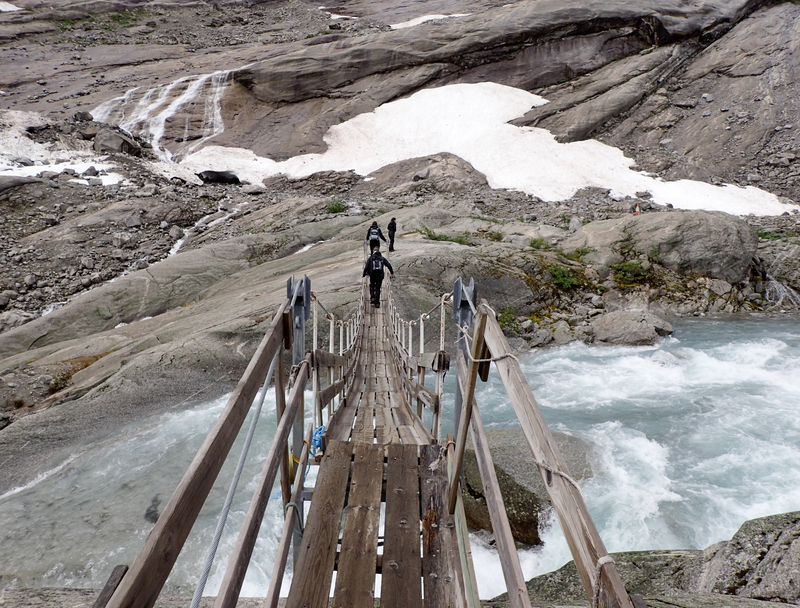 Fortunately, I managed to avoid falling into the glacier run-off or down a rock face. Cold waterlogged feet were well worth the opportunity to get up close to this. At 487 square kilometers (188 square miles), the Jostedalsbreen glacier is the largest in mainland Europe and I saw only a tiny sliver of it: the Nigardsbreen arm. 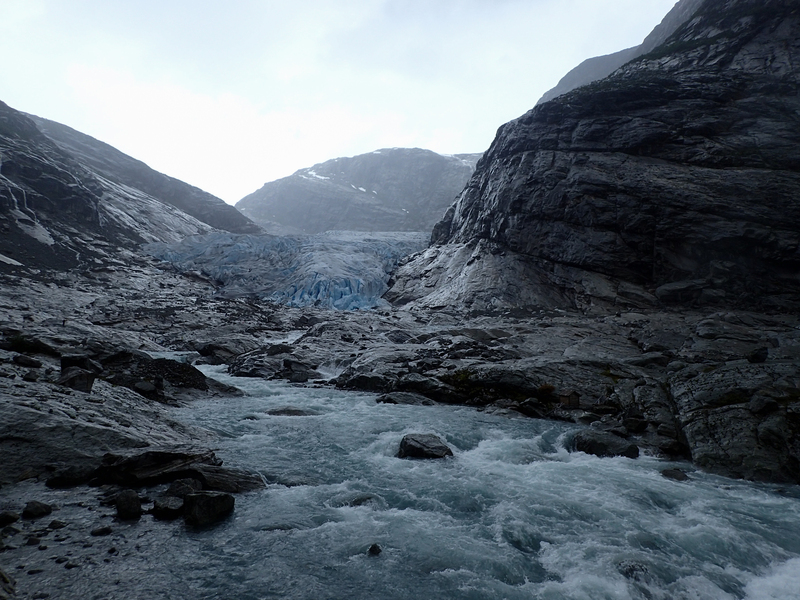 The glacier is up to 600 meters thick in some parts but I didn’t have the opportunity to see that. I suspect doing so requires a multi-day commitment to wearing crampons and carrying provisions. Not surprisingly, the glacier flows into a lake, this is the start of it. 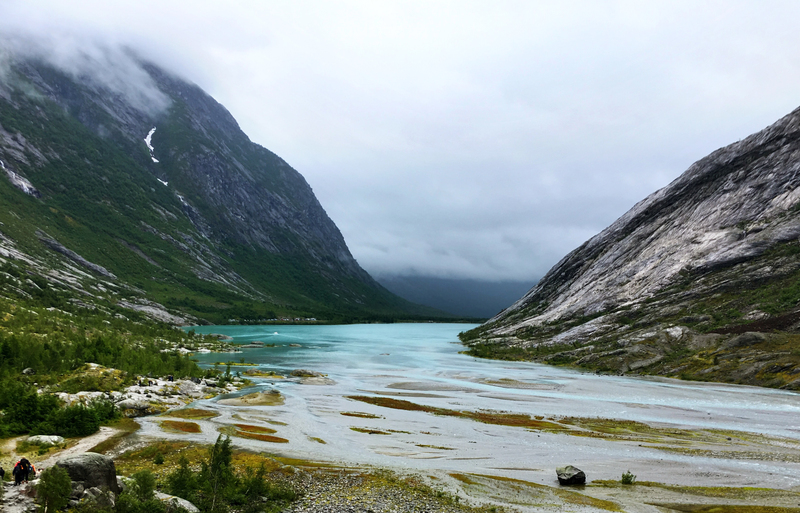 Glaciers melt and grow over time and the Nigardsbreen arm is known for having destroyed multiple farms that once sat at its base. Today, the black pollutants that circulate through our atmosphere and rest atop the ice are trapping heat and speeding the glacier’s melting. 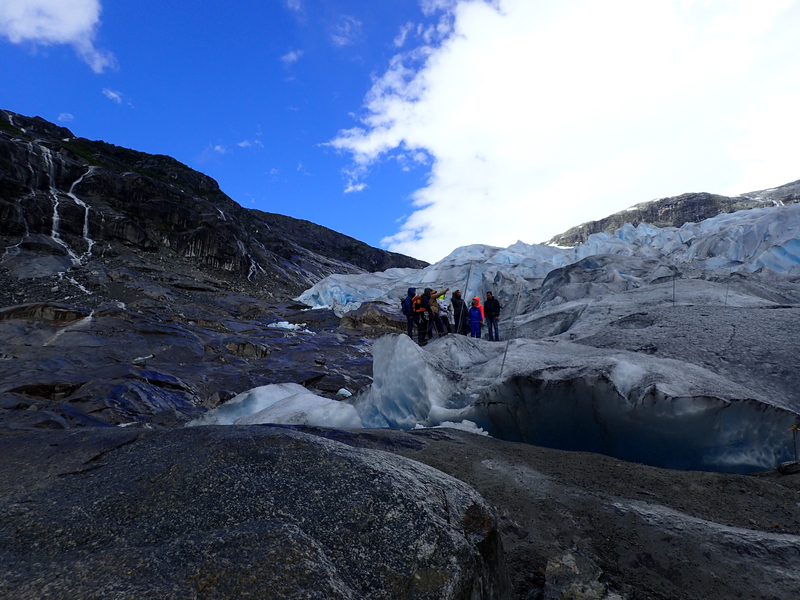 According to our guide, the glacier moves 2-3cm a day at its center. You may not be able to see it but a sheet of ice down there covers running water. Our twenty-something guide for the day grew up in the area and remembers when this hole was the size of a pencil. As I walked across the ice, crampons strapped to my flimsy shoes, I felt it crumble and shift. Like moving through tightly packed marbles. Looking to my side, I saw water flowing beneath clear sheets of ice and pools of water appeared here and there. 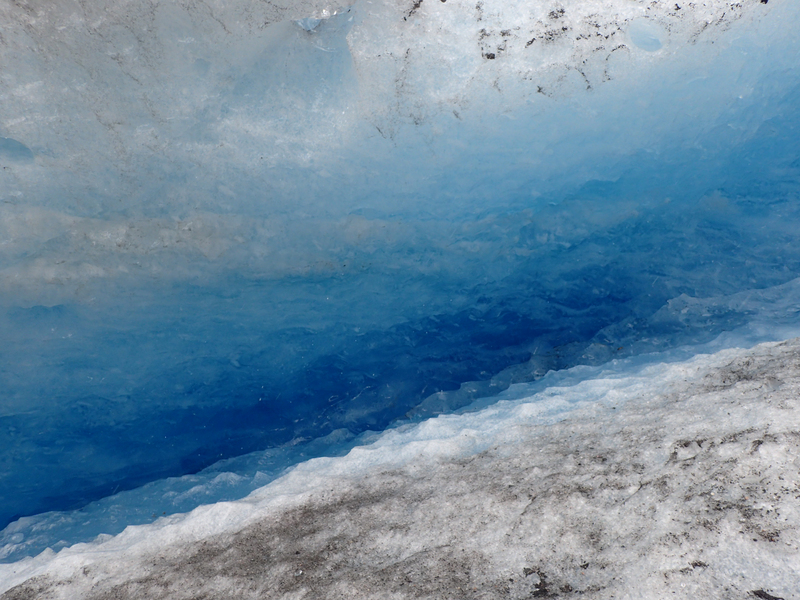 The vibrant blue of the ice drew me in with its beauty and for a moment, I thought about the days when people crossed the glacier wearing reindeer skins and fur hats. The years when so much ice melted, entire farms were wiped out of existence. It was unlike anywhere I’ve been before, nothing like standing on the packed snow of a mountainside. There’s been ice in the spot where I stood for thousands of years and even with our planet warming up, there will likely be ice there for a long time to come. Long, at least, by a human scale. 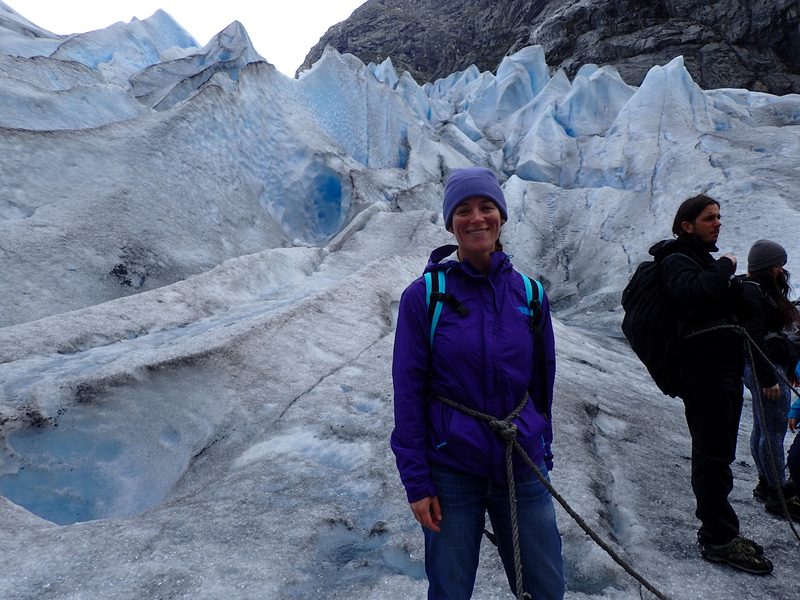 I did only a short walk on the glacier, a family walk suitable for children over 6. Crampons were provided and we were all tied to one another, our guide clipped on to the rest of us. 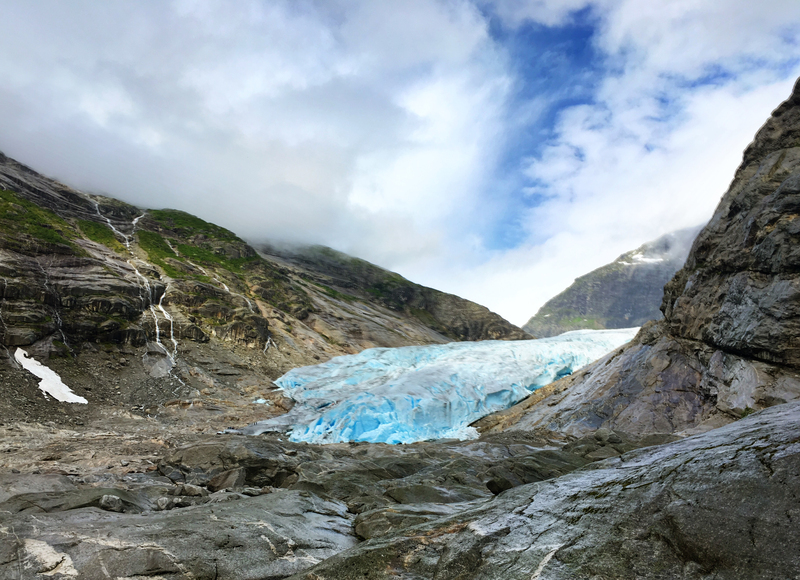 It rained as I walked up to the glacier but I got lucky and the hour spent on the ice was clear. Within minutes of removing my crampons, the rain returned. It was a slippery walk back down but one I would have enjoyed with better footwear. My travels rarely take me to cold places but this hour on a glacier was enough to remind me that I’m just as awed by frozen places as I am by searing hot ones. If I’m properly dressed, that is. I don’t have any plans to be in a cold climate again for some time but maybe I should think about a trip to Antarctica one of these years. Perhaps for this event in 2022. 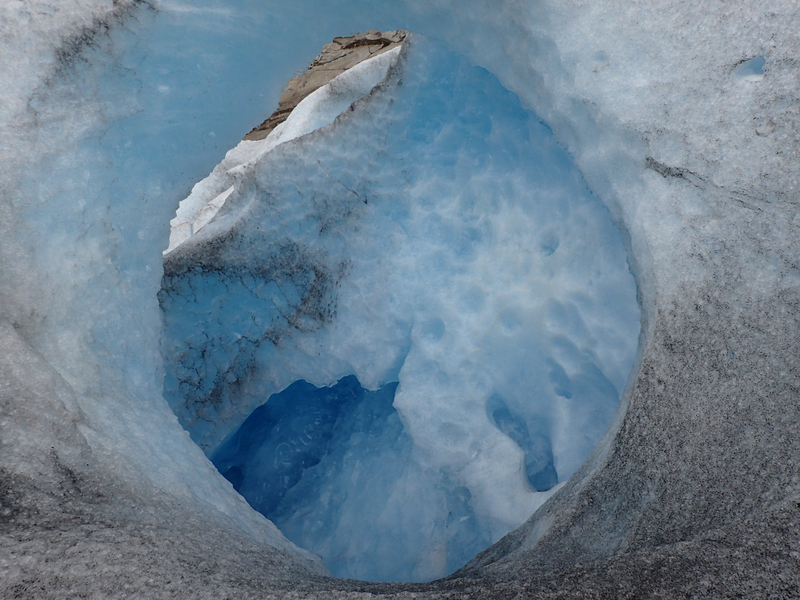 Looks like a mini Exit glacier, the one Bear Grylls walked to with Obama. Just out of interest how many new countries has 2016 brought you so far? Hi Sara, I’m afraid I don’t recall the name of the hike I did but it was organized there at the glacier and was the easiest, shortest hike offered. You can see the base of the glacier from the visitor center and walk around a bit on your own if you want to keep things easy and not exert much effort. I hope you enjoy it and have a wonderful trip! Thanks for the reply . Appreciated. Meaning you arrange your own transport till the glacier and choose the hike on you own without following any tour agency right ? I was actually looking at Sognefjord tour + glacier hike due to time constraint ( description is 4 hours of hike ) And I believe that package is for more extensive and more difficult hike . Hi Sara; yes, I hired a car for the day with others and we drove to the glacier where I joined one of the guided walks and the other people chose to walk around the base on their own. I’m not familiar with the tour you mention. I hope you have a great trip, whatever you decide to do!